Hey everyone! I’m Zack Bertok, founder of Thylacine Studios and creator of Siralim. 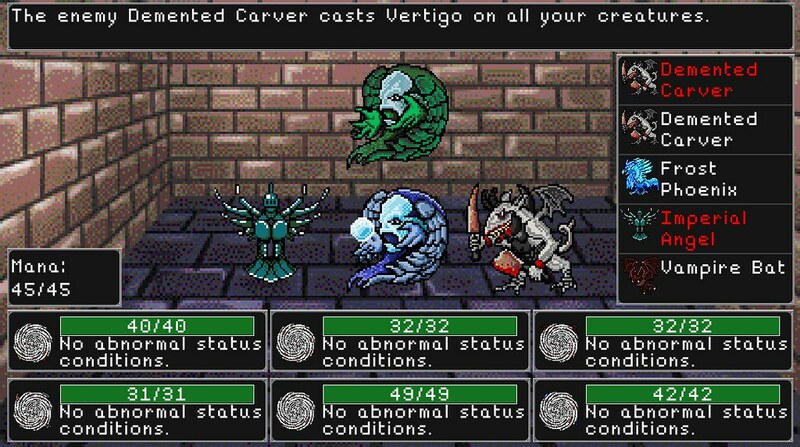 Siralim is a deep, monster capture RPG where you can summon and customize hundreds of creatures to fight by your side. You’ll need these creatures to help you travel through randomly-generated dungeons and complete randomized quests. While doing so, you’ll find rare treasure that can be used to upgrade your castle, empower your creatures, craft powerful artifacts, learn new spells, and much more. I’m very excited to announce Siralim is launching at the end of 2015 as a cross buy game for PS4, PS3, and PS Vita. You’ll start your journey in Siralim, which happens to be your very own castle. Siralim is the central hub of the game where you’ll manage your inventory, upgrade your items, and things like that. You can also upgrade Siralim to add new rooms and entice new citizens to live in your kingdom, thereby unlocking new game features. One of the early upgrades you might consider purchasing is the blacksmith, who can craft powerful weapons and armor. You might also want to invest in the enchanter’s room, which will allow you to make those weapons and armor even more powerful. You can craft and enchant equipment to augment your creatures’ power, or to grant them new abilities. There are more than 500 different crafting materials to collect. The meat of the game takes place in randomly generated dungeons known as Realms. In each Realm, you’ll be given an optional quest known as a Duty to complete. However, your main focus should be to collect treasure and defeat your enemies. There are hundreds of different events and interesting things that can happen in each Realm, so each adventure will be a fresh experience. There are currently eight different Realm environments for you to unlock, such as the fiery Chaos Realm, the peaceful Life Realm, and the chilly Winter Realm. Each Realm environment offers unique treasure and events that you won’t find anywhere else! Battles are turn-based, similar to what you might find in early Dragon Quest or Final Fantasy games. Conversely, you’re not doing any of the fighting yourself; instead, you’ll summon creatures to fight for you! There are more than 300 unique creatures to capture and summon, and each one has its own unique abilities. You’ll find that the key to success is to form a strategic team of creatures with abilities that effectively synergize with each other. 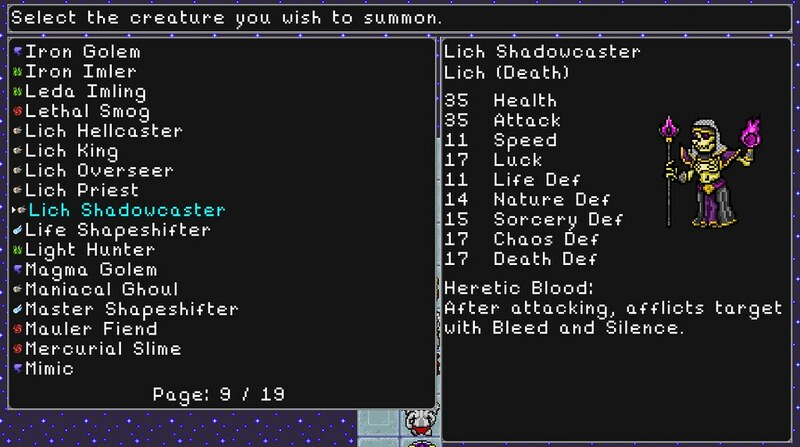 In addition, you can find spell scrolls to cast any of 100+ different spells to turn the tide of battle. When you’re tired of exploring Realms and completing Duties, you can also do battle in the arena to earn valuable prizes. Or, you might want to summon powerful bosses to fight using a type of item called a Sigil. If you defeat those bosses, you’ll earn legendary crafting materials that can be used to enhance your creatures’ weapons and armor. If you’re not looking for a fight, you might head over to the tavern and play a game that you’re sure to lose with the gambling dwarves. Of course, that’s only if you can pull yourself away from Nether Egg crafting, a process that allows you to create eggs that will someday hatch into extremely powerful, and highly customizable creatures. You will never run out of things to do. The game is meant to be playable forever, and we leverage the elements of experimentation, exploration, and the player’s own imagination to create an experience that is sure to entice anyone who is looking for a deep RPG experience. Want to play until your character is level 937? Go for it. I’d love to hear what you think about Siralim, so please leave a comment if you get a chance! And make sure to keep an eye on Playstation Store toward the end of 2015 for the game’s release! Looks inspired by Dragon Warrior Monsters on the Game Boy. I’m definitely intrigued! Thanks for your interest! The game is very much inspired by DWM. We were sad to see that many of the recent installments of that series didn’t make it over to the West, so hopefully Siralim will scratch the itch that I know so many people have for this type of game. It’s like some of my very favorite game series met up on the internet, got together irl, group dated, had a really weird living situation together that had all the neighbors talking, then wound up with a baby, and it was born on the current gen console i i play everything on. This just has me superexcited, the game i never knew i wanted, but always left a dull, aching hole in my soul. I’m going to go sit in front of my PS4 now, and hold the controller in anticipation until this comes out. Somebody come feed me. Nice, might be a nice Pokemanz substitute for those of us who prefer the PlayStation side of things. Should be pretty cool for Vita. 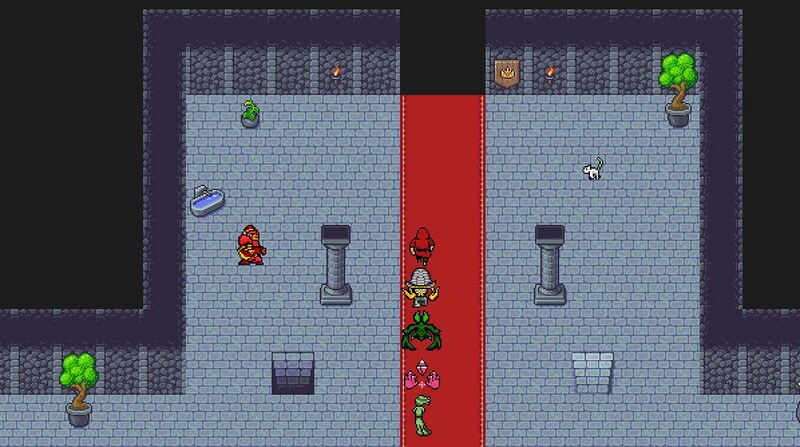 Early Dragon Quest/Phantasy Star vibes too. It’s more of a sub for Digimon. Pokemon is too competitively built for this to be a replacement for the adult community, not cute enough for the kid community… It’ll find a niche’ but it’s more comparable to Digimon or Fire Emblem without Perma Death. Not sure if the game is too ambitious or not. 300 creatures and 500 crafting items. Usually that’s exciting as you expand upon a previous game. To have a retro style game coming out with that, is probably gonna seem overwhelming to people. I might pick it up at some point. Not immediately, not with Disgaea 5 coming out before then. This looks great. It has old school flare with a lot to do. What will the price point be? And will it have a Platinum trophy? Thanks for your interest! We’re looking at a $9.99 USD price point right now. Not 100% sure about a platinum trophy but we’ll try! When I click the screenshots, they take me to a Yahoo login page??? Wow…does this take me back. Do you control the monsters in combat or do they do their own thing? I didn’t see any menus on the battles that’s why I ask. Thanks for your interest! You have direct control over all your creatures in battle. There’s a menu on the left side but only when it’s your turn. You can use this menu to attack, defend, provoke, cast spells, flee, and a few other game-specific things. Cool, will buy this on PS4 when you guys release it. Look like a cool mix of Ultima and old school Dragon Quest but YOU NEED to work on those character status panels at the bottom of the screen. No character/creature pic or name for your team? Huh? It shows your creatures’ graphics, but in that screenshot a spell is being cast on all your creatures. That swirly circle thing is a spell animation in progress. I really like the underlying ‘bones’ of the game, but as constructive criticism, I would recommend adding a lot of polish to the art and interface. There are an awful lot of palette swaps going on for the monsters, and overall it just looks kind of.. undercooked. I will eagerly check back closer to release though, as this game really looks like it has potential. A lot of graphics were changed since those screenshots were taken. There are no longer simple palette swaps for any of the creatures, and the interface will receive some fixes before the game is fully released at the end of this year. Looks very promising! Reminds me of a classic King’s Bounty vs Heroes of Might & Magic style. Eager to check back as release approaches! Much needed & unique add to the play station library. I have one question: the game will come translated in spanish or other languages? @Dark_Relic: We’re only planning an English release for now, but that could always change! My Vita is an RPG machine. Always happy to stick more of those on there. This looks deliciously retro. Just gotta finish all those Squaresoft RPGs I bought last week first! This game looks absolutely amazing. Zack — please do everything you can do to ensure it releases on Vita on time as well as securing a Platinum trophy. Those are a big deal! Absolute Day 1 purchase from me at 9.99. Great price, great sounding game, sounds amazing! Ok, I have many questions. 1) Is this game going to feel grindy, or repetitive in any way or are there little treats along the way to keep us from burning out? 2) Will our characters animations alter with our equipment choices? 3) With it being randomly generated, is there a set plot? Or is this like one of those “Choose your own adventure” books? 4) Multiplayer Arena, or solo? 5) Would you need anyone to play it for feedback, or do you guys have review copies available? Sorry for all the questions, but this seems like an incredibly ambitious title…one that is right up my alley! 1) The game is centered around farming and grinding. A lot of our players from other platforms say that the game has more than enough surprises to keep the game from feeling like a repetitive chore, though. 2) Not in most cases, but you can dye your creatures different colors. 3) There isn’t much in the way of a plot. There is a virtually endless amount of content in the game so we want players to focus on setting their own goals and even using their imaginations to create a story for themselves. This game has stayed on my radar with Touch Arcade’s coverage of the work that’s consistently brought to it. Great to see it’s viable to bring to other systems. Thank You for the timely feedback! It sounds like it would certainly be right up my alley! Must. Come. Soon. Must. Grind. Must. Build. Castle. ArrrghhI cant wait for this game. Thank you for your interest! The game will be cross-buy. Love the Cross-Buy, but what I am most interested in is, is it Cross-SAVE?